Naima is a talented painter of traditional alpana patterns, which Bangladeshi women and girls paint on their houses for special celebrations. But Naima is not satisfied just painting alpana. She wants to help earn money for her family, like her best friend, Saleem, does for his family. When Naima's rash effort to help puts her family deeper in debt, she draws on her resourceful nature and her talents to bravely save the day. Includes a glossary of Bangla words and an author's note about a changing Bangladesh and microfinance. 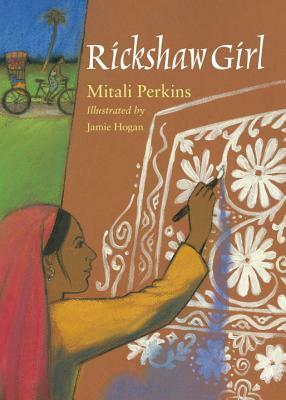 Mitali Perkins is the author of several novels for children, including SECRET KEEPER, the First Daughter series, BAMBOO PEOPLE, MONSOON SUMMER, and The NOT SO-STAR-SPANGLED LIFE OF SUNITA SEN. She lives in California.